I worked on my Roubo bench some more. 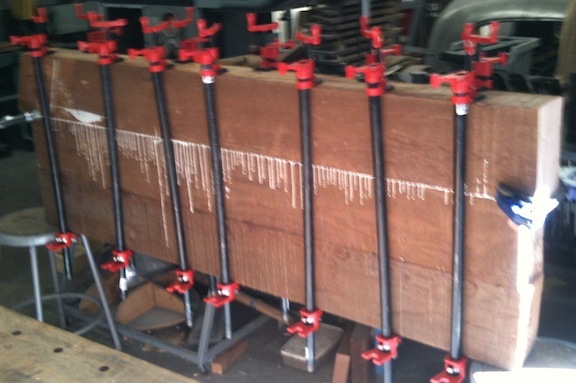 After some consideration I decided that the 17.5″ width I had from gluing up just two of the beams wasn’t enough. It may have actually been fine (the bench I’m using is even narrower), but I decided to try to stick to the rules outlined by Christopher Schwarz in his workbench books. He recommends 20″ to 24″ in width, with 18″ being marginal and a little “tippy”. So I jointed one edge of the previous glue-up and one edge of the remaining beam. Jointing the previously-glued-up assembly went very quickly. 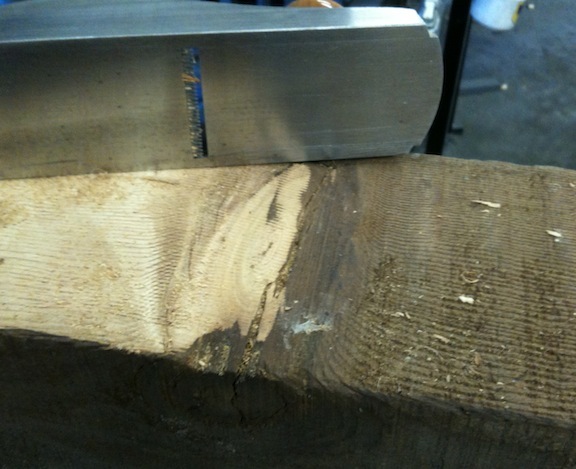 I used the scrub plane to remove the rough exterior and get rid of the major lumps. Then I went to a Stanley #5 jack plane and worked out the lumps from the scrub plane and improved the “trueness”, checking it with my giant straightedge (a 5′ bar of 1/4″ thick by 4″ wide steel that I had laying around). Then I switched to the Stanley #8 and flattened it, checked it for twist and set it aside. This is a terrible picture, sorry. Things were a little more interesting with the other piece of wood. It had a big knot, which was also a major high spot on the face. 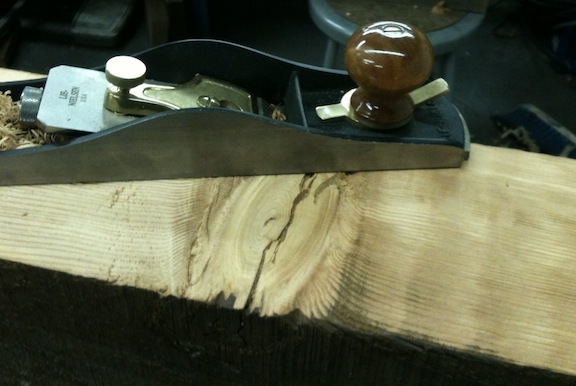 The knot and the scrub plane don’t get along. I leveled everything else with the scrub plane, then I fit a toothed blade in my Lie-Nielsen low angle jack plane and tried it on the knot. It shaved it down without complaining! Here I’m about half way there, you can see there is still a big gap under the edge of the plane. 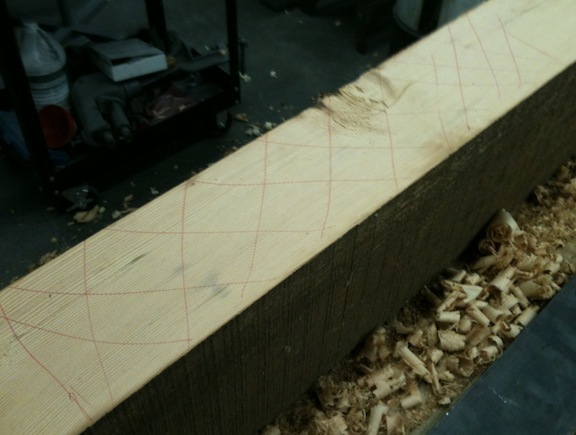 I worked it from both sides; my goal was to bring the knot below the surface of the surrounding wood. 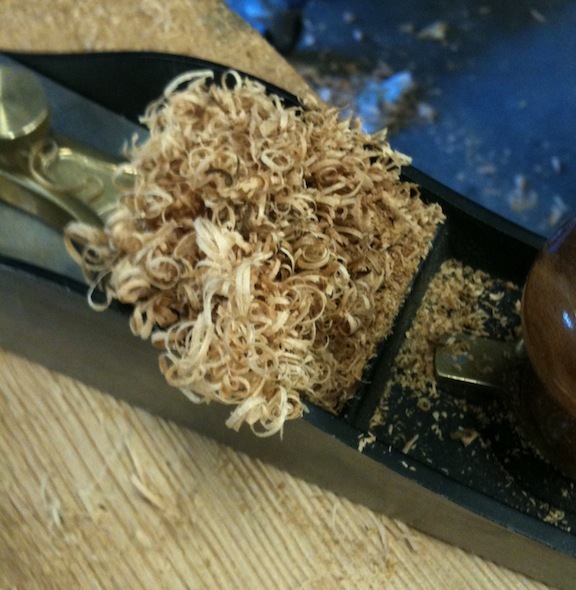 If you haven’t used a toothed plane before they make little tiny curly shavings. One of the guys at the Lie-Nielsen hand tool event in Oakland recommended this blade for roughing, and it worked out really well on this knot. More planing, and eventually I got the knot and the last of the rough surface leveled. I was really worrying about the knots in the wood, but I think it’s going to work out OK.
As I worked the surface down toward flat I used a red pen to mark the high spots I’d find with the straightedge or winding sticks. I’d work those down and check again. Once it got close I started making full length straight passes with the #8. OMG, that thing is a workout. But heart racing, sweat dripping, gasping for breath, I got it trued up. I had my 11 year old son help me lift it into place to check the fit and fine tune things. Then we glued it in place. I used “too much” glue – I’m not at all concerned about the squeeze out because it’s all still rough and unsurfaced. I’ll leave it in the clamps all week because I probably won’t have time to do anything until next weekend anyway, I’ve got about 26″ of width now, so I’ll have to rip 2″ or so off to end up at my target 24″. That should be interesting. Once I get it ripped and cross-cut to size I’ll start flattening the exterior. 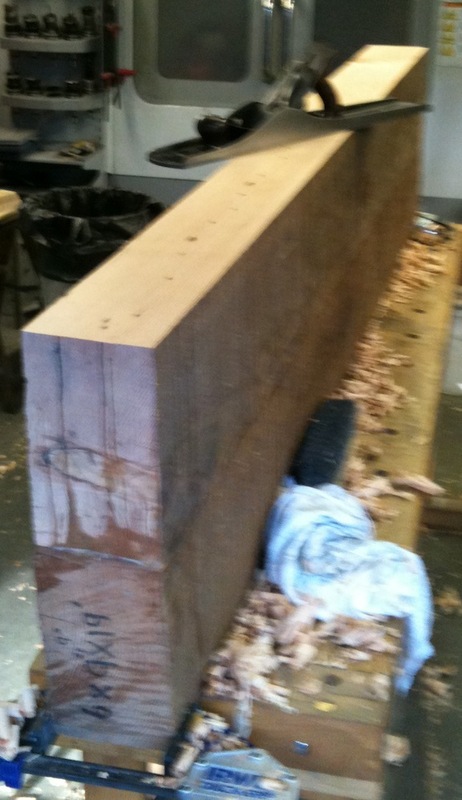 I plan to use 6 x 6 fir for the legs, and maybe 4 x 6 or 4 x 8 for the stretchers. Cutting the joinery for the legs will be another learning process.